Many people have experienced “ringing in the ears” on occasion, especially after being in a loud environment. But tinnitus—the perception of a noise heard by an individual that is not caused by any source in the external environment—is one of the most common issues related to the inner ear. of people with tinnitus have nearly constant symptoms. In fact, information on tinnitus is so sought after among those who suffer from it, that it’s one of the most frequently searched hearing and ear-related issues on the internet. Exactly what the individual experiencing tinnitus hears differs from person to person. While many people refer to tinnitus as ringing in the ears, others describe it as a high-pitched hissing, a low-pitched roar, chirping, screeching, and even musical sounds. Typically, however, the sounds perceived are relatively simple. What’s more, people can experience tinnitus in both ears or just one. It can remain constant or simply come and go at different times. And some people only hear tinnitus if they’re in a completely quiet setting, where little sound is coming into their auditory system from the outside. Technically, tinnitus isn’t a disease. It’s a symptom. Usually, people with tinnitus also have some degree of hearing loss. Tinnitus often is associated with damage to high frequency hearing, most commonly due to exposure to loud and/or prolonged noise. Less commonly, tinnitus may be accompanied by an exaggerated sensitivity to sound, known as hyper’acusis. Although tinnitus is most commonly associated with hearing loss, other conditions and lifestyle histories are linked to tinnitus as well. It’s important that people who experience tinnitus discuss it with their primary care physicians. They may be referred to see a physician expert in ear disease, typically an otolaryngologist—or an ear, nose, and throat specialist (ENT)—for a hearing test and to determine whether or not there is an underlying cause that requires medical attention. More than 200 medications, including some as common as NSAIDs (nonsteroidal anti-inflammatory drugs). Experts generally believe this is due to the medication’s effect on the cochlea—part of the inner ear that is essential for hearing. 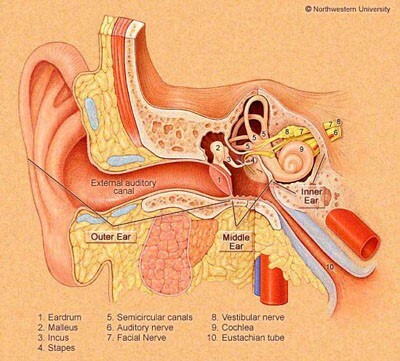 (See diagram of the ear below.) Some medications can have a temporary effect on hearing, which stops when the medication is discontinued. Other medications, such as some chemotherapy drugs, which are known to be ototoxic, may cause permanent hearing loss and associated tinnitus. Photo provided as a courtesy from Northwestern University. Most tinnitus comes from damage to the inner ear, specifically the cochlea. Far less often, tinnitus may arise from other issues, including damage to the nerve between the ear and brain (vestibular nerve), from injury to the brainstem (Lanska et al 1987), and, rarely, to the brain itself. Although tinnitus often is caused by an injury to the inner ear, the perception of tinnitus is actually generated in the brain. There is a specific type of tinnitus known as pulsatile tinnitus. With pulsatile tinnitus, people hear something resembling their heartbeat in their ear. Pulsatile tinnitus usually has an underlying cause, sometimes related to the cardiovascular system or other issues that would increase blood flow or turbulence. It’s important to see a medical professional to get an accurate diagnosis. People frequently experience ringing in the ears after a loud rock concert or other noisy event. This is typically because of a temporary dulling of hearing due to the degree and duration of loud noise. This short-term loss of hearing is called a temporary threshold shift in hearing. Following any loud event, it’s important to give your ears a rest from noise and remain in a quiet environment. This helps your ears recuperate. Recovery time from a temporary threshold shift varies from person to person. And it depends upon the degree and duration of the noise exposure. This type of temporary tinnitus and hearing loss may last just a few hours, but sometimes it can last for days. Regardless, it’s likely that the noise trauma caused some degree of permanent damage to the delicate hair cells in the inner ear. These hair cells, which vibrate when set in motion by sound waves, are—in a way—the gatekeepers to hearing. When they vibrate, they release chemicals that, in turn, stimulate the auditory nerve. Then, the auditory nerve signals the brain, where actual “hearing” takes place. Once these hair cells are damaged or die, they cannot be replaced. So, it’s important to protect yourself from loud environments in the future to prevent any further damage to these hair cells and your hearing. Many local pharmacies carry disposable earplugs made of foam or silicone that are effective in helping to block out dangerously loud noise—while still allowing for conversation and the ability to hear music. Another option is custom ear protection, offered by many audiologists, to ensure an optimal fit, which will help maximize protection from loud sounds. Many people with tinnitus learn to manage it effectively. Seeing an otolaryngologist or ENT will help ensure that any underlying cause is appropriately treated, which could resolve the tinnitus. If the tinnitus is linked to hearing loss alone, it’s unlikely that it can be eliminated altogether. But usually, it can be managed. Because tinnitus often results from noise-induced hearing loss, hearing aids have been shown to help. In fact, many newer models have “sound therapy” features specifically designed to give people relief from tinnitus. But hearing aids often help for other reasons, as well. By amplifying other sounds, hearing aids help increase auditory stimuli, thereby reducing the prominence of the tinnitus. What’s more, the strain of constant, intensive listening to compensate for hearing loss can be stressful and exacerbate the tinnitus. Simply by easing the effort to hear, hearing aids can be beneficial for managing tinnitus, many people find. Devices called “sound masking,” “sound,” or “white noise” machines can be purchased and may help alleviate tinnitus. These sound masking devices are based on the idea that tinnitus is usually worse when things are very quiet. These sound machines create subtle background noise, such as nature sounds, ambient sounds, or what is called white or pink noise—constant, calming background noise over a wide frequency range that drowns out other sounds. For many people with tinnitus, these sound masking devices either fully or partially deflect the individual’s attention from their tinnitus, providing relief and relaxation. For some people, the solution to masking the tinnitus can be as simple as running a fan, a decorative water fountain, a radio, a television, or keeping recordings of ocean surf or other soothing sounds playing in the background. Music apps, such as Apple Music, Pandora, and Spotify, frequently have play lists that are suitable. But CD’s also are available. And pillow speakers, made for nighttime listening, can be practical, so as not to disturb others. Many audiologists who evaluate and offer treatment for tinnitus can fit people with personalized maskers that are specifically selected and tailored for the individual’s specific needs. An audiologist who specializes in tinnitus also can advise people on the use of specific tinnitus, sound, and sleep apps. For some people, tinnitus can be particularly intrusive and difficult to manage. Specific types of cognitive and behavioral therapies may be helpful in managing the anxiety, depression, and/or anger and frustration that sometimes accompanies more severe tinnitus. Audiologists specializing in tinnitus often have information on Tinnitus Retraining Therapy, Tinnitus Activities Treatment, and Progressive Tinnitus Management. Other therapies—such as Cognitive Behavior Therapy, Mindfulness-Based Stress Reduction, Acceptance and Commitment Therapy, and Hypnosis—can be provided by qualified mental health professionals. Typically, healthy lifestyle habits tend to ease the stress that can be associated with tinnitus. These include regular exercise, stress reduction, following a healthy diet, adequate sleep, and avoiding stimulants such as caffeine and nicotine. Learn about donating to AHRF to fund research specifically on tinnitus.